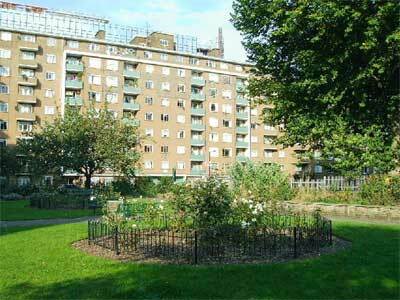 Nelson Square Gardens was originally for the use of residents of Nelson Square. In 1903 the owner, Viscount Halifax, gave the site to the LCC and it was laid out as a rectangular playground, with flower bed in the centre and shrub and privet hedge around the perimeter. It opened to the public in February 1904. There was formerly a bandstand and ornamental drinking fountain presented by the MPGA. The garden has 6 mature plane trees but is now mainly laid out as a tarmac playground, alongside which is a small rose garden with ornamental planting. Nelson Square Gardens was originally for the use of residents of the Square, in 1903 the owner Viscount Halifax gave the site to London County Council, and it was laid out as a rectangular playground, with flower bed in the centre and shrub and privet hedge around the perimeter, opened to the public in February 1904. The cost to lay it out was £1,400 with half this amount met by owners of the houses and the remainder by the LCC and Southwark Metropolitan Borough Council. There were six mature plane trees, which remain in the gardens, that had circular seats provided around them; there was a bandstand with flower beds and an ornamental drinking fountain presented by the MPGA. The terrace of almshouses at one end of Nelson Square is all that remains of the original buildings, built between 1807 and 1810 possibly designed by Samuel Pepys Cockerell, now used by the Blackfriars Settlement. The rest of the housing around the square are now medium rise flats, c.1950. Today the garden square is mainly a tarmac playground enclosed by a wire mesh fence. Alongside it is a small rose garden enclosed by c.1930 cast iron railings on brick footings. Improvements were carried out in 2000/1 designed by Jennifer Coe Landscape Architects with new play equipment, new railings/fencing, surfacing with money raised by Bankside Open Spaces Trust (BOST) through the Cross River Open Spaces fund. Local people re-planted the rose garden and a gardening club undertakes work here, set up by BOST.